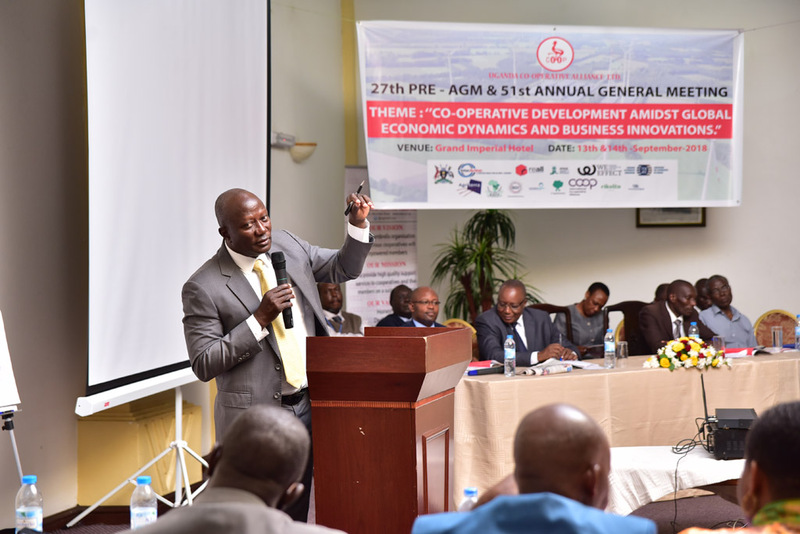 On 14th September 2018, Uganda Cooperative Alliance held its’ 51st Annual General Meeting at Grand Imperial Hotel in Kampala with over 200 delegates from Cooperative Movement. The Chief Guest, State Minister for Cooperatives Hon. Fredrick Gume informed delegates that the Cooperative Movement is the ideal way to develop this country but cooperators should be focused on where they are going. The Minister informed members that Micro-Finance Support Centre is partnering with the Ministry of Trade Industry and Cooperatives (MTIC) to train 20 Cooperative Unions. In his final remarks, the Minister tasked UCA to assist in reviving of Cooperatives and ensure that Cooperatives turn away from the old way of doing business. About the Cooperative Bank, he informed members that the report from the Auditor General is out on the defunct bank and thus requested UCA to quickly do something about reviving the Bank or else he will do it himself. He declared the 51st AGM officially opened. 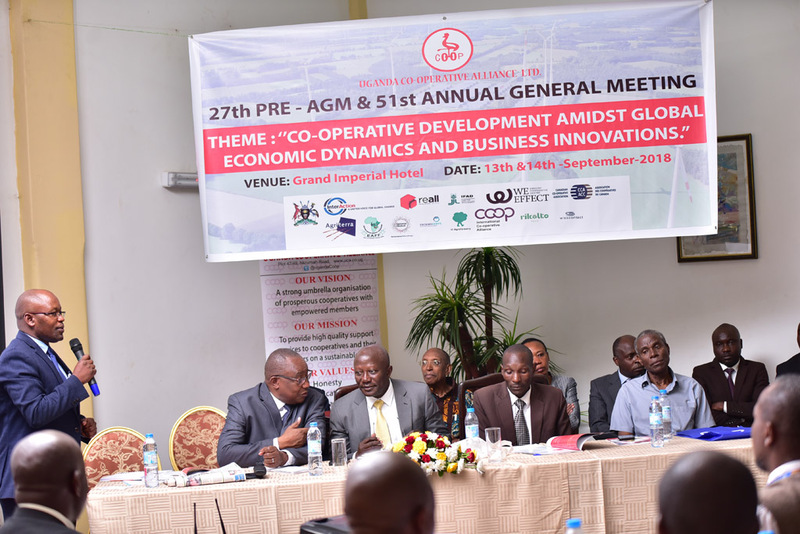 At this year’s Annual General Meeting the delegates elected Board Members to govern Uganda Cooperative Alliance. 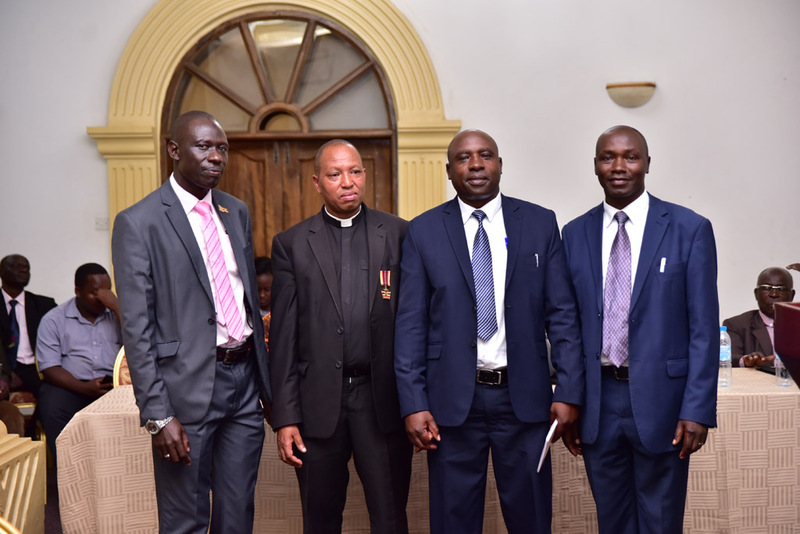 Mr. Johnas Tweyambe – Chairman Board, Mr. Jacan Oyenya as Vice Chairman, Fr. Safari Emmanuel- Treasure and HW. Seyekwo Geoffrey Emma as the Board Member. The Chairman Search Committee Mr. Tom Tibamwenda Wakigoma thanked the delegates for electing a competent Board and also appreciated the role of Ministry is assisting the team to elect the new Board. Vi Agro-Forestry represented by Mr. James Walusimbi the Deputy Country Manager informed members, that he was privileged to be with the Cooperators and the main objective of Vi agroforestry is to support farmers in Uganda and that’s why they are partnering with UCA since it covers the largest number of farmers in the country. He recognized Mr. Leonard Msemakweli, the former General Secretary, UCA for his support in designing some of the programs used by Vi Agroforestry in training. Cooperatives being supported by Vi Agroforestry include; Ankole Producers Cooperative Union, Banyankole Kweterana, Kibinge Cooperative etc. In conclusion, he vowed their commitment to serve the cooperators. Ms. Josephine Belinda from the local government and coordinator of Community Agriculture Infrastructure Improvement Program(CAIIP) She informed members that CAIIP has constructed and enabled rehabilitation of roads, constructed Agro-processing facilities to ensure the development of cooperatives and farmers.CAIIP signed a MoU with UCA to ensure that these facilities are managed and used by cooperatives. Some of the challenges faced include access to power, the productivity of the areas, lack of awareness of the benefits of cooperatives. In conclusion, she requested cooperators to look for these facilities in their areas and put them to use. Mr. Kenneth Nkumiro representing Chief of Party Tecno Serve informed Cooperators that Techno Serve is proud of the work that UCA under the Producer Organization Activity funded by USAID in line with feeding the future. From Project for financial inclusion in Rural Areas (PROFIRA)Mr. Collins congratulated UCA upon the 51st AGM which symbolizes good governance and good working relationship. PROFIRA is happy with the work it contracted UCA in training 73 SACCOs in the western region. Ms. Zipporah, the Managing Director of Cooperative Insurance Company (CIC)informed Cooperators that CIC is the fastest growing insurance company which is 100 percent owned by the cooperators and the cooperative movement. In conclusion, she invited cooperators to come on board and buy shares. She thanked UCA for their support in promoting the Cooperative Movement in the country. Copyright ©2018 Uganda Cooperative Alliance Limited. All Rights Reserved.